VW tries it again in U.S.
Bill Keys worked for Volkswagen's auto assembly plant in Pennsylvania for nearly a decade before losing his job when the German company shut down the factory in 1988. Keys said he still lives near the New Stanton, Pa., site, which at one time employed more than 5,000 workers but now sits empty. "It was something seeing cars roll off the line," he said. "I'd try it again." VW itself is trying again with a $1 billion Chattanooga plant, and officials said they're intent on not seeing a repeat of history. New plant officials have consulted with former Pennsylvania executives about mistakes that were made there. "We have a U.S. strategy," said VW Chief Executive Officer Martin Winterkorn at the new plant's dedication ceremony last week, adding the failed Westmoreland County, Pa., experience was "a long time ago." VW shut the West Pennsylvania factory after it had lost money for five years, according to The New York Times. At the time, the company said sluggish sales and intensified competition in the small-car market offered little chance of becoming profitable. VW's experience then helped push the company into retreat from the U.S. market for over two decades. While VW made major inroads in China, South America and Eastern Europe, its market share in the U.S. dropped to under 3 percent. 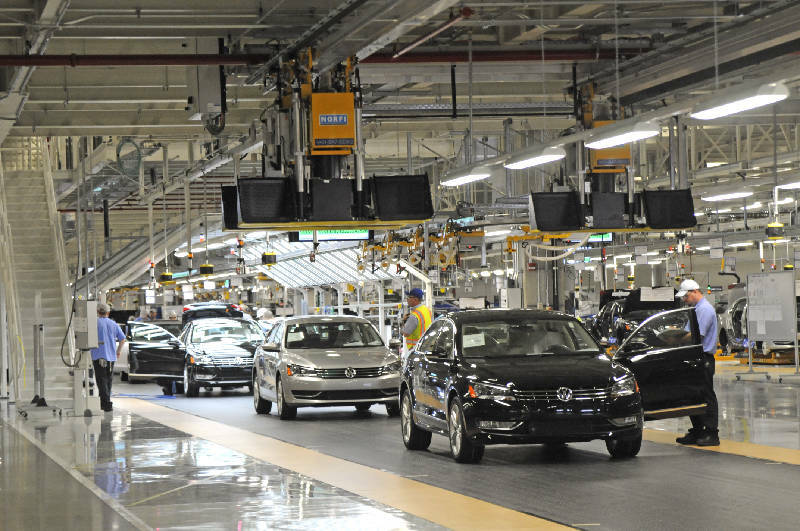 VW officials said the Chattanooga plant and its all-new Passat are aimed at helping it reverse the slide and again make it a major player in America. Frank Fischer, CEO of Volkswagen in Chattanooga, said the Pennsylvania plant didn't have the right product. The VW Rabbit, he said, was modified from the German version and "maybe not ready for the U.S. market at the time." Keys, in a telephone interview last week, recalled VW priced the Rabbit out of the market. He said the company added too many options and turned an affordable car into one that was too expensive. The Passat undergoing assembly in Chattanooga is designed for the American motorist, according to VW, larger than the car it's replacing and with creature comforts such as more cupholders. Also, VW has cut the base cost on the new Passat to just under $20,000, down about $7,000. Keys said that in addition to the Rabbit, the company introduced a pickup truck in New Stanton. He called the truck "a flop ... a piece of junk." Fischer said the Pennsylvania factory building, which VW bought from Chrysler, imposed limitations on the company. In contrast, he said, the Chattanooga plant is new. Fischer said the factory boasts a "state-of-the-art layout and state-of-the-art technology." The Rabbit produced at the Pennsylvania plant had a large number of parts imported to the U.S., Fischer said. Before the plant closed, the U.S. dollar was so weak amid currency fluctuations that it made little sense for VW to keep the site open, he said. In Chattanooga, however, most of the car's parts, about 85 percent, come from suppliers in North America, Fischer said. "That is very essential to us," he said. Keys, who was a materials coordinator in Pennsylvania, recalled there were times when crucial parts were rushed in by helicopter or Lear jet so the assembly line wouldn't go down. He added that some American vendors weren't reliable. Fischer said the Chattanooga plant's human resources department has done well in hiring and training staff members, which number more than 1,700. Employment could reach 2,500. In Pennsylvania, he said, employees were selected not for skills, but rather on how long they had been out of work. In terms of management, Fischer said, VW has brought in experts to ensure quality. He said it wasn't just the product problems in Pennsylvania, but the operation didn't have "Volkswagen DNA." Keys gave the German management in Pennsylvania high marks. American managers who came from the Detroit Big 3 automakers - General Motors, Ford and Chrysler - didn't get the job done, he said. "We were better off when the Germans ran the place," Keys said. He said the plant was unionized in 1979, and he maintained that wasn't an issue. Any labor strife had to do with safety and work rules rather than pay and benefits, said Keys, who was a union member. Bob King, president of the 400,000-plus-member United Auto Workers, said earlier this year the UAW is interested in organizing the VW plant in Chattanooga. VW has said that employees will have to decide for themselves. Winterkorn declined to address the union issue last week, saying it wasn't the right time.